Here’s a view for those who love hiking and rock climbing in Hawaii. Interested in hiking and rock climbing in Hawaii? Hawaii is truly the perfect vacation destination. It can provide soothing relaxation for those who want to rest. But it can also offer fun for families who enjoy the great outdoors and enough adventure for thrill-seekers. Prefer to think outside the box or want more adventure than the typical tours advertise? If so, traveling to Hawaii will prove to be just the journey you are looking for. 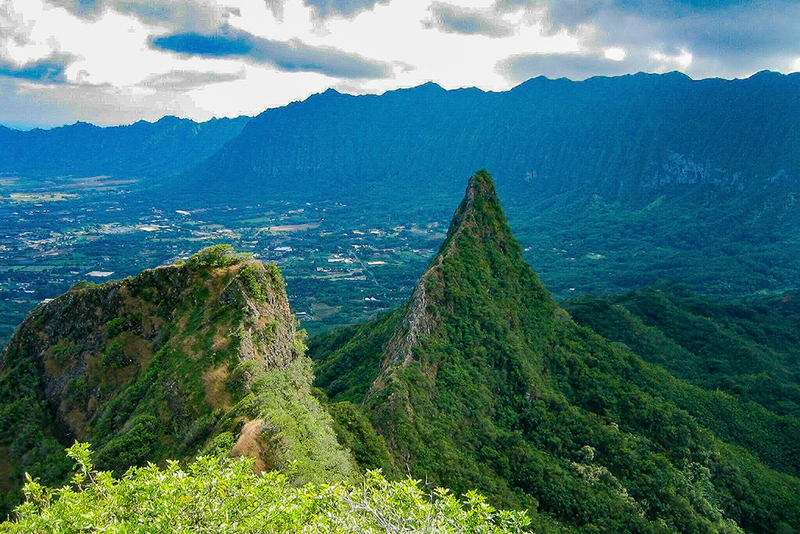 Check out our Hawaii Travel Tips before you pack your bags and trek into the vast wilderness. Doing so can help you unlock some of the islands’ many secrets. Waimea Canyon in Kauai, another good place for hiking and rock climbing in Hawaii. The Garden Isle has innumerable trails. But the trail to Kalalau Valley has some of the truly unique areas to venture out on a backpacking trip. The trail takes about 9 hours. While on it, you’ll see picturesque beaches, white-water waterfalls and rugged coastlines along the way to the campsite. Another challenging hike is the Na Pali trail which stretches for an 11-mile one way hike on the jagged hillsides. After 2 miles, there is a picturesque Hanakapi’ai Beach. However, the strong currents here make this place an extremely dangerous place to swim. So absolutely do not venture into the water here. The hike continues after the beach for another 2 miles, concluding at the refreshing Hanakapi’ai Falls. Bear in mind, hiking beyond Hanakapi’ai Beach requires a permit, as the trail becomes increasingly treacherous. 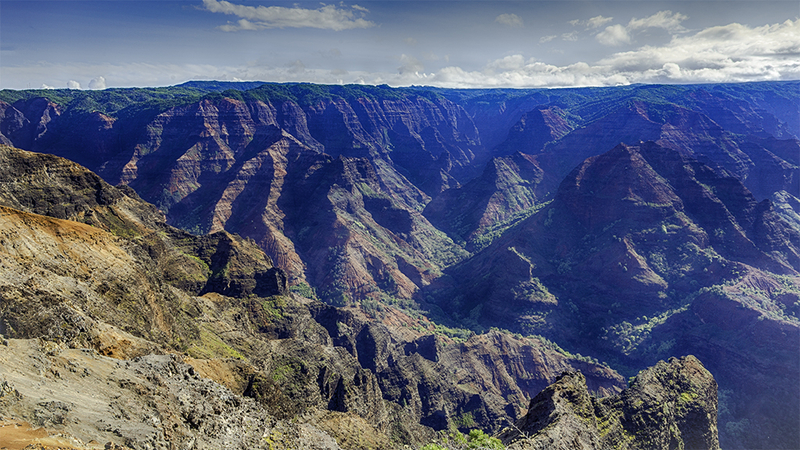 Last but not least, hiking through Waimea Canyon offers strikingly colorful landscapes of red dirt and green foliage. 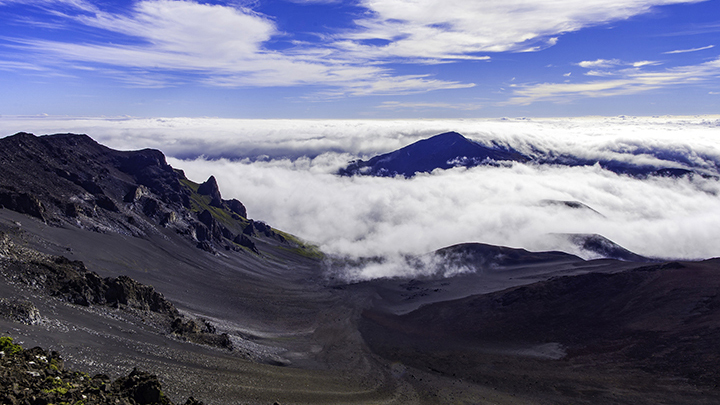 Hiking in Haleakala National Park is one of the most popular destinations for a panoramic view. But travelers can also backpack through the national park. Here, you can stay at various cabins and other pit stops for a multi-day journey through the crater. The Ke Ala Loa O Maui Pi’ilani Trail north of Hana Bay is a 3 mile hike along through lava coastlines. It’s a spectacular place to hike. The Waihe’e Ridge Trail on the northwest side of the island is the perfect way for hikers to view the 270 foot high Makamaka’ole Falls. Though the beginning of the hike seems bland at first blush, visitors are rewarded with astonishing views of Waihe’e Ridge and the sparkling ocean in the distance. The trail to Waimanu Valley on the North Kohala coast is a challenging hike and starts in secluded Waipio Valley. It is 16 miles of very steep terrain, with sometimes uneven slippery rock and cliffs. Hikers will have to cross 14 streams and fight off mosquitoes on this path. In Waimanu Valley one will find waterfalls, valleys and lush green landscapes where trekkers can pitch a tent and go fishing on a nearby black-sand beach. There are 9 campsites in Waimanu Valley allowing for backpacking crews to pick and choose how far they want to explore. 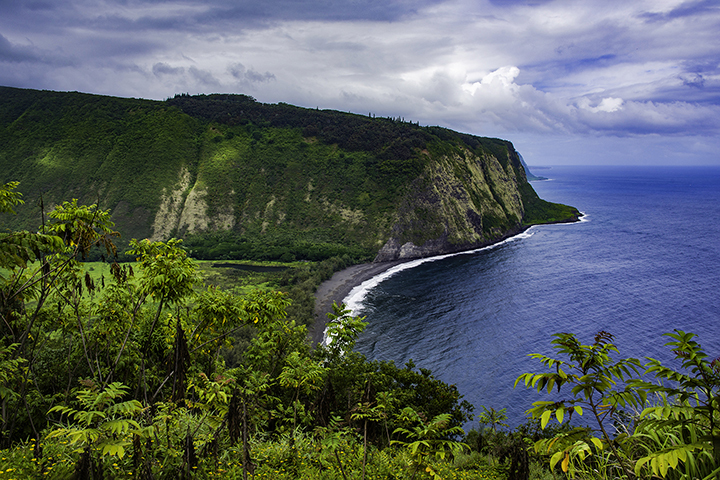 Also in North Kohala, is the Pololu Valley trail which takes you to the valley’s pristine black sand beach. The 12 mile (round trip) Napau Trail in Hawaii Volcanoes National Park is an exhilarating hike that takes you through recent lava flows close to the most current eruption site at the P’u O’o vent. Be sure to bring sufficient water as the black color of the lava flow will heighten the heat of the overhead sun as well as exercise extreme caution as those on the trail can be subject to a number of volcanic hazards, such as toxic smoke and extreme high heat from lava flows. Be sure to get the necessary permits to allow you to backpack, hike or camp in these areas. Contact the Hawaii State Parks department for more information and permits at (808) 587-0300. Do not drink the fresh water from streams without first taking proper purification measures. Take all necessary precautions, exercise common sense as it pertains to your safety as well as carefully and strictly heed all posted warning signs. There have been fatalities in a number of these places because some have decided to ignore the posted warnings. Many tourists traveling to Hawaii are aware of the wealth of outdoor sports that await athletic visitors on the islands. One such activity is rock climbing, and though Hawaii is known for lava formations, mountains and cliff walls on every island, Oahu is the best for accessible rock climbing locations; so don’t forget pack your helmets, harnesses, shoes and ropes when you go to Hawaii! Oahu offers both lead and top-rope climbing at Mokule’ia, located on the northwest part of the island, and offers a rock face scaling of a 90 foot cliff near glittering coastlines and leafy foliage. It takes thirty minutes to hike to the base of the climb, but the views behind the face of the rock are well worth the brief trek to get there. There are numerous routes, some of which are graded at relatively high degree of technical difficulty; so you are bound to experience a challenge. As a result, you should only try to scale such rock faces if you are truly experienced at doing so and have the necessary safety equipment. After hiking and rock climbing in Hawaii to your heart’s content, you can always top off your vacation with a helicopter tour of the island you just explored. For those who enjoy feeling the wind in their hair, and the ocean spray in their faces, delving into the depths of Hawaii’s natural beauty first hand is the best way to discover the islands for yourself.